Using multiple Google calendars is a terrific way to share and maintain separate schedules for different groups of people. It’s easy to create them, and you can share them by specifying a list of people, providing a link, or simply making the calendar public/searchable. In this post, I’ll walk you through the steps necessary to create a new public calendar, retrieve its URL, and create events for your subscribers. 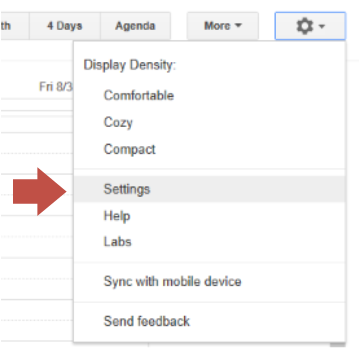 All of your calendar management needs can be found in Google Calendar Settings. Calendar Settings are accessed by clicking the gear drop-down and selecting Settings. 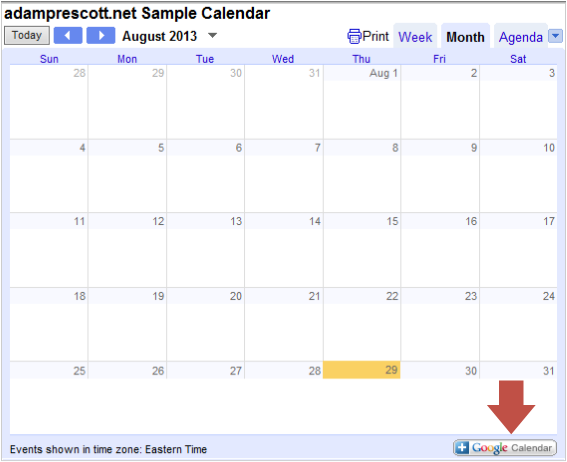 Then, go to the Calendars tab and click the Create new calendar button to create a new calendar. There are a few important settings related to sharing when creating a new calendar. The first is whether you’d like the calendar to be public. Public calendars are visible to everyone and can be found by searching, so you shouldn’t use a public calendar for anything you don’t want to be public. (Duh.) Note, however, that there is a sub-option to hide the event details on your public calendar. This allows you to publicly share your availability without letting the world know exactly what you’re up to. You can also list specific people you wish to share your calendar with and specify what permissions they have. If you have a large group, this can be cumbersome, but it’s your bet for sharing a non-public calendar. So, you’ve created your public calendar, and you want to share it with the world. Your easiest option is to provide people with the URL. Getting the URL is simple but not so obvious. Head back to the Calendars tab in Calendar Settings, and click your public calendar to edit its details. Toward the bottom, you’ll see a section labeled Calendar Address with colored buttons for XML, ICAL, and HTML. Each button is a link to the calendar in a different format. Click the desired link, and you’ll get a pop-up with the URL for you to distribute. If you’re sharing with other Google Calendar users, I suggest using the HTML link. When users browse to the calendar, there’s a little + Google Calendar button in the bottom-right corner. 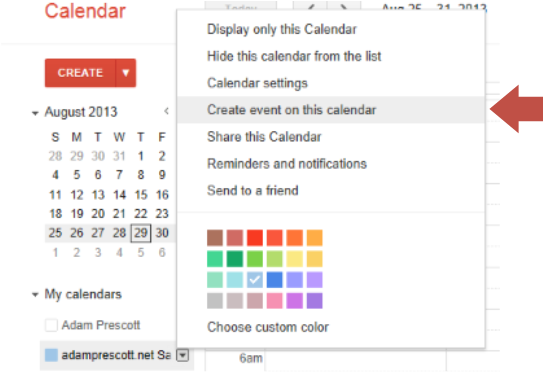 Clicking the button will prompt them to add the calendar to their own Google Calendar. You’ve got the calendar. You’ve got subscribers. What’s left? How ’bout some events!? Adding an event to one of your many calendars is as easy as you’d hope: click the drop-down indicator next to the calendar and choose Create event on this calendar. Enter the event details and save. Boom. Done.